Even as the Chicago Bears prepare to make their latest foray towards a successful season, GM Ryan Pace must keep one eye towards the future. As was the case this year, he has a lot of expiring contracts to sift through before the 2019 season goes active. Several of which are important and others that could be if the right circumstances are met. It’s early but here is a quick breakdown of each expiring contract. To be specific this list only includes future unrestricted free agents for the time being. Either they will be gone by no later than next offseason, given a limited extension or a long-term extension. Who makes the cut? There is zero competition for Bray this year as the third-string backup QB. The Bears brought him in to help Mitch Trubisky absorb the new offense faster. He’s safe for 2018 but the Bears may look to find a long-term replacement for Chase Daniel in 2019. The new offense under Matt Nagy and Mark Helfrich will feature a lot of spread and West Coast styles. Neither of those systems featured big roles for the fullback. Maybe Burton survives for one more year but he may not even last that long. In truth, it may not matter what happens with White at this point. If he crashes and burns again, he’ll have cemented his status as a draft bust and be cut loose. On the other hand, if he breaks out for a good year, the Bears may not have the financial flexibility to keep him after spending so much on Allen Robinson and Taylor Gabriel. He’s not the most sure-handed target in the world but Josh Bellamy is an able reserve who helps on special teams. That last part could be the deciding factor in his future. If he continues to perform well in the third phase, he might stick around. The odds don’t favor it. Another special teams ace the Bears scooped up in free agency. The difference with Fowler is he’s also a fairly decent receiver. Nothing flashy but good for a meaningful catch every now and again when people don’t expect it. He should come back on a cheap one-year deal. This isn’t the same player that had a good early run in Baltimore. Brown feels like a veteran flier and extra body for training camp. He has little special teams value. This means he’d have to shock some people in camp and preseason to earn a spot. That’s unlikely. The odds are if anybody else other than Mark Helfrich had been made offensive coordinator, Hroniss Grasu would likely be cut this year. He’s never been an overly good center and that torn ACL did him no favors. Maybe Helfrich, who coached him at Oregon can change that but that seems like a stretch. The Bears brass genuinely loves Kush as does new line coach Harry Hiestand. He’s a strong, tough blocker who gets after in the run game. He can also move well. The ideal backup interior lineman whom the team can trust to start whenever needed. If he survives without injury this year, he should return for another. Nothing about this signing felt exciting. Watford was mostly an average blocker during his time before arriving in Chicago. His best hope is as a primary backup at tackle or guard. Even that feels unlikely with a number of young projects the Bears are trying to coach up. People have slammed Bobby Massie a lot but that’s not totally fair. He’s played decent during his time at right tackle. That said, he’s no longer in an offense that suits him best. 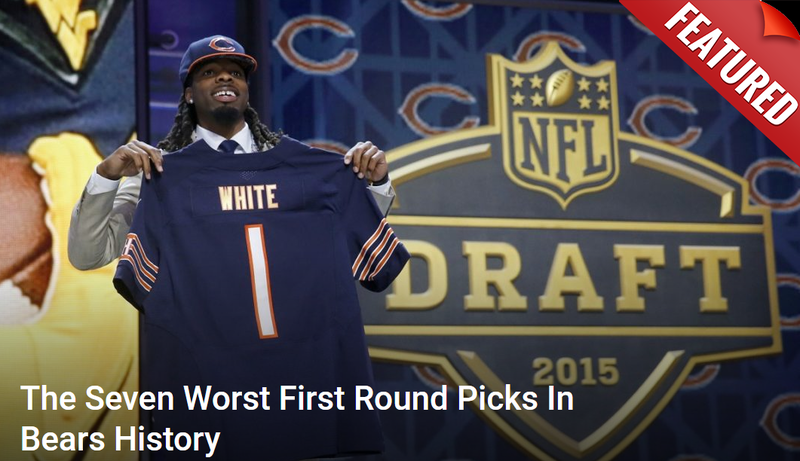 The Bears want to throw the ball and pass protection was never his strength. Look for them to find a more able replacement next year. This is by far the most important contract the Bears will have to tackle next offseason. Eddie Goldman has become a fixture on their defensive line, a dynamic nose tackle who stops the run and squeezes the pocket up the middle. If he continues to stay healthy the Pro Bowl could be in his future and he’s still just 24-years old. Most fans would know nothing about Williams and that’s no surprise. He’s never held a meaningful job other than backup. He’s a camp body who fits their system well and will help out in practice. Don’t expect him to survive final cuts though. He did enough in 2017 to warrant another one-year deal as a backup to Goldman and Akiem Hicks. Jenkins never lived up to his full potential but he’s a decent enough reserve provided he avoids injury. Does he survive beyond this year? That’s hard to see. The Bears are starved for pass rush help at the moment, so they’ll take in anyone they can get. Aaron Lynch got a one-year deal because he’s not exactly trustworthy given his poor production and health issues the past couple seasons. That said he’s still young. If he turn in even a modestly good year, he’ll get a solid extension to stay with Vic Fangio. The massive influx the Bears have made at inside linebacker this offseason pretty much spells the doom of both Anderson and Timu. Anderson is the most likely to be gone by final cuts. Timu may survive as a special teams fixture. Still, Roquan Smith and Joel Iyegbuniwe are the future in Chicago. He’s one of the most frustrating players on the entire roster. When Callahan is healthy and on the field, he has all the qualities of a true starting nickel corner in the NFL. The problem is he can’t do that often enough. It’s why the Bears only tendered him for 2018. They want to see if he’s worth long-term money. This feels like it might finally be his year. It was a mild surprise the Bears brought Cooper back at all. Not only was he ineffective for the most part last season, his special teams gaffe against Pittsburgh was almost unforgivable. Maybe Fangio thinks he can still turn him into a solid player but it doesn’t feel like he’s much more than a roster bubble guy at this point. The Bears were pleasantly surprised when Adrian Amos re-emerged last season to have his best year after getting benched. What they want to know now is whether he can do it again. Was 2017 a one-year wonder or has he actually turned the corner as a pro? Given he’s found his role in the scheme, things should go smoothly for him on the contract front.